Large deer standing in forest. Home to an estimated four million white-tailed deer and up to 250,000 mule deer in rainy years, Texas is a favorite destination for deer hunters. While ammunition and safety regulations are consistent within Texas, hunting seasons vary slightly across the vast state. Mule deer season lasts for a few weeks, while white-tailed deer are in season for several months. Texas requires deer hunters of all ages to possess a valid hunting license. Additionally, all hunters over the age of 17 must carry a driver’s license or identification card from the Texas Department of Public Safety to verify their identity. Those who fail to follow Texas hunting regulations may lose their hunting license, be fined up to $10,000 and face jail time. Additionally, equipment used to commit a crime is subject to seizure by the state. Hunters over nine years of age must complete a 14-hour hunter education training course. Texas requires all hunters on public land to wear at least 400 square inches of hunter orange. This must include at least 144 square inches of orange on the chest and back, and a hunter orange hat. Deer hunting is not legal from public roads or the right-of-way associated with public roads. It is not legal to own a deer or any part of a deer that was hit by a vehicle. However, as long as you harvested the animal legally, it is legal to sell many of the non-edible portions of a deer carcass. These parts include deer hides, antlers, hooves, hair and sinew. It is illegal to use automatic weapons, air rifles or pellet guns while hunting any game in Texas. Rimfire ammunition is illegal for hunting deer in the state. Bow hunters must use broad-headed arrow tips; explosive and poison tips are prohibited. 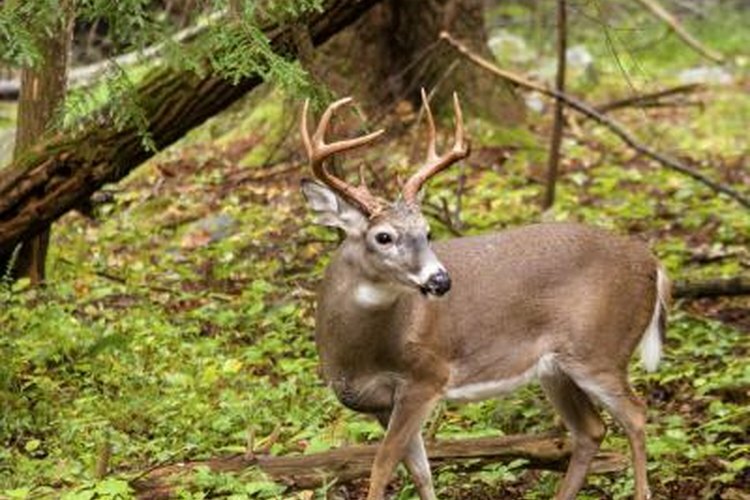 Hunters may hunt deer with crossbows during all general open seasons. The state allows handicapped hunters to use crossbows during archery season in several counties. All crossbows must have a minimum draw weight of 125 pounds, feature a mechanical safety and have a stock of 25 inches or more. Texas permits the use of manual, mouth-operated, recorded or electronic deer calls. Baiting is permissible on private, but not public, property. You cannot use dogs to pursue deer in Texas, but they can be used to track wounded deer. Open deer hunting seasons vary across the state, and with the species of deer. Archers can begin hunting both mule deer and white-tailed deer in late September. Mule deer open season is rather short, lasting for a few weeks in early winter. White-tailed deer season is much longer, and different sub seasons occur from late September through early February. It is legal to hunt deer in Texas from one-half hour before sunrise to one-half hour before sunset.